in the April 2007 issue of Hi Fi News magazine. 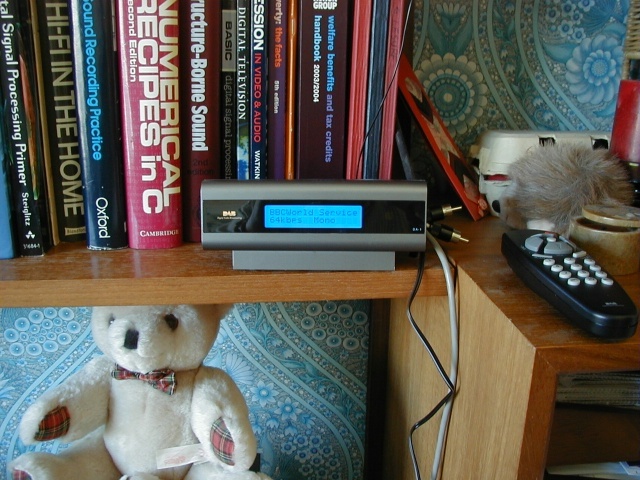 My experience with DTTV made me want to be able to hear stations like the BBC World Service in other rooms around the house. Hence when I saw a cheap ‘DAB adaptor’ for sale in a local shop I bought one on impulse and gave it a try. I used this in a background listening system I’ve put together in the room where I tend to write articles like these. This system already included an FM tuner that I’d been happy listening to for many years. So adding the DAB adaptor gave me the chance to compare FM vs DAB, and choose whichever I preferred. I was quite surprised to find that after a few months I was regularly preferring to listen to R3 via the DAB adaptor rather than via FM. Admittedly, this was comparing two items that weren’t exactly at the peak of contemporary audio. The FM receiver is in an old Armstrong 626 receiver, made some decades ago. The DAB Adaptor is a Mitsui DA-1 bought for about £30. You should be able to tell from this that I wasn’t expecting too much from DAB at the time! along with books and a teddy bear to give some idea of size. The sound quality on many DAB stations was as I’d been warned – in the range from ‘mediocre’ to ‘dire’. However on BBC R3 it often sounded quite good to me. This lead eventually to my buying a Pure 701ES DAB tuner for use with my main audio system. It also set me wondering about why I generally preferred R3 on DAB to on FM, despite DAB bitrate concerns. However after spending a lot of time switching back and forth I decided that when R3 was being transmitted at 192kbps the data reduction on DAB wasn’t actually the main cause of the differences I felt could hear between FM and DAB. What was most obvious was that DAB had an audibly wider dynamic range with less background noise than on FM. Given that the most obvious audible difference was in the dynamics I did some comparison measurements. These involved simultaneously recording the output from an FM tuner (Yamaha CT7000) and a DAB tuner (Pure 701ES). I then analysed the results using the same methods as for my previous article on DTTV. For the sake of example I’ll use a broadcast of a piece by Ravel which I recorded during the early afternoon. Figure 2 shows the percentages of the time the sound peaked at a given level. Here the line plotted in red shows the results for FM, and blue for DAB. It can be seen that the FM shows clear signs of level-compression. Figure 3 shows an example of how the peak levels on R3 FM and DAB vary with time. These results use the same broadcast as Figure 2. The upper graph of Figure 3 shows the sound powers (colours as Figure 2). The lower graph plots the difference between the FM and DAB sound levels. We can see that the sound level on FM during extended quiet passages of music is being lifted by around 8-10dB compared with DAB. Level compression on R3 FM isn’t a recent introduction. In Trevor Butler’s Radio column in the May 1989 issue of Hi Fi News he announced that the BBC had started applying up to 8dB of automated level compression to R3 FM on the 6th of March of that year. At the time this was restricted to the mornings before 0935, and the ‘drive time’ between 1730 and 1900 each weekday. They initially used an Optimod 8101B unit to apply this level compression. From listening, and the tests I have made, it looks like things have not improved since then. Perhaps Trevor was right at the time to say that, “The end of true dynamic range on R3 draws nearer...”, at least on FM for much of the time! His stated value of 8dB seems pretty much like what I measured in 2006. But my example was taken from the middle of the afternoon, not the early morning or ‘drive time’. So it looked like it is now routine to automatically level compress BBC R3 on FM. As Figure 3 shows, the level compression is more complex than can be seen in Figure 2. This is for two reasons. Firstly, brief transients – e.g. the initial strike of a piano note – have their level rapidly dragged down, and the gain is then slowly wound up again during the sustained part of the note. This has the effect of reducing the impact of the start of the note. It also makes the warmth of the sustained portion that follows more obvious than would be the case if we were sitting in front of the actual performer. The result can be like an elegant form of ‘sustain pedal’ effect. This behaviour shows up clearly in the lower graph in Figure 3. Secondly, the level compression may be applied in frequency bands. Hence the tonal quality of the music may be altering in ways that aren’t shown in either Figure 2 or 3. The above all matters when someone who is acclimatised to the ‘sound’ of BBC R3 FM starts listening to R3 on DAB (or DTTV). The initial impression can be a lack of ‘warmth’ that the listener expects and has come to assume is part of the original sound quality. The clearer, more clinical dynamics may seem harsh at first. The problem here is that if a listener is unaware of this they might easily assume that differences they hear are due to the data losses and bitrate chosen for DAB. The level compression on FM makes it hard to compare FM with DAB or DTTV on a like-for-like basis. Instead we have to make a balanced judgement where a number of effects may act to the advantage or disadvantage of each transmission system. So far as I can tell, at present  the BBC tend not to apply any ‘automated’ level compression at all to R3 on DAB or on DTTV. Indeed, a BBC spokesperson on the R4 ‘Feedback’ program recently  commented to this effect. If so, the dynamic range and tonal balance of what we hear on DAB R3 can be expected to be much closer to the sound in the concert hall or studio than on FM. That said, someone I know in the broadcasting industry has told me that the BBC use different models of ‘Optimod’ sound level processors for FM, DAB, and DTTV. Whatever the details, the results are audibly different. The snag being to reliably decide why. The above results all relate to BBC Radio 3 using 192kb/s. Alas, the situation on most other stations is very different. All the other stations use much lower bitrates on DAB, and there is a tendency for them to be very heavily level compressed. This is illustrated by Figure 4 which compares FM versus DAB for BBC Radio 1. As before, the red line is for FM, and the blue for DAB. In this case we can see that FM and DAB are almost identical. To make the relative behaviours clearer we can replot the measurement results as shown in Figure 5. This accumulates the percentages of the time the audio peaks at or above a given level. You can see from Figure 5 that R1 spends about 50 percent of the time in the 3dB range close to the maximum modulation level! Whereas R3 is in this top 3dB for less than 5 percent of the time. In effect, R1 has a dynamic range of just a few dB. Figure 5 does make it look like the R1 DAB signal is more level compressed than on FM. But this difference is only around 1dB which was the resolution of the analysis I carried out. So we can only really conclude for R1 that DAB and FM are pretty similar in terms of dynamics. Figure 6 shows a histogram of the dynamics I obtained when I did a similar measurement on BBC R4. In this case I only made a brief recording so the statistics aren’t as well-defined as for R1 and R3. This makes the plots less smooth, but even so you can clearly see that DAB and FM have similar overall distributions. They also have a reasonably wide spread in values – ironically, far wider than R1! So it looks like any level compression on R4 tends to be modest, and is applied in much the same way for both DAB and FM. I did not check R4 on DTTV, but it is worth noting that DTTV has some advantages over DAB for BBC ‘talk’ stations like R4 and the World Service. For example, at times R4 on DAB is transmitted in mono at reduced bitrates whilst it is on DTTV in stereo at a higher bitrate. So DTTV may be the best bet for these BBC stations if you don’t have satisfactory FM. For music stations in general it is difficult to draw a simple conclusion from the results I obtained. This is because the situation with BBC R3 seems quite distinct from the rest of the pack. DAB R3 seems (so far at least!) to have held onto being transmitted at a higher bitrate than the others. Hence for BBC R3 it seems to me that DAB and DTTV have some audible advantages over FM. By using DAB or DTTV you can avoid the level compression, background noise limits, etc, on FM. Alas, I can’t say the same for stations like R1. There, regardless of the transmission system, the sounds are heavily level compressed and processed. To what extent this is the main reason the results sound awful to me I can’t say for sure. Heavy level compression can also mean higher distortion levels on FM. Yet another factor which may affect any comparisons. The bottom line is that although the chosen bitrates may well be degrading the sound on many stations, these other factors may be causing other audible degradations that could be worse. And if the source material is grossly compressed (and clipped) pop/rock CDs, the entire process becomes largely worthless if you are wanting high fidelity to any actual original sounds. It becomes mainly a matter of choosing your own preferred – or least annoying – types of professionally applied distortions... Personally, I find R1 and most of the other ‘popular’ stations sound too nasty to be able to listen to them, regardless of transmission system. I have now  settled on generally using DTTV for listening to BBC R3 – and to go further I find I prefer Prom broadcasts on BBC4, also via DTTV! My initial reaction that DAB/DTTV lacked the ‘warmth’ of FM changed as I realised I was acclimatised to expect the effects caused by subtle level compression. The uncompressed sounds are actually more realistic, and give me a better sense of the dynamics of the actual performance. Alas, I can’t say much that is positive about most other national FM/DAB/DTTV music stations I’ve tried regardless of the transmission system! Nor am I very confident that in the future the BBC won’t – yet again – fiddle about with bitrates, or start to add level compression, thus making my findings of no more than historic interest! However I would suggest that if you try to compare R3 on FM with DAB and DTTV that you be prepared to spend some time on the process and not simply go with your initial reactions. You may start off in the same situation as I did. With hearing expectations ‘habituated’ to assume that the changes actually produced by the level compression on R3 FM were part of the sound. For other music stations I fear such comparisons may be futile. They may simply sound dire regardless of the choice of transmission system!